The HSE has come under extreme pressure over the Console controversy. THE HSE HAS appeared before the PAC in light of recent irregularities at suicide prevention charity Console. The committee heard from Tony O’Brien, director general of the HSE, that an audit was carried out when Console increasingly failed to provide information and attend meetings in relation to their accounts. The internal audit, which should have taken 12 weeks, was deferred because of “considerable resistance” from the then-CEO Paul Kelly. The PAC also heard that Paul Kelly pretended to be a doctor in the early 1980s as a “prank” in a now-closed Dublin hospital. There is no record of the Department of Health having informed the HSE or its precursors about Paul Kelly impersonating a doctor. The HSE also stated that they were unaware that charity status had been withdrawn from Console in June. The organisation’s Assistant Director General Dr Geraldine Smith said that she found out through reports in the media. When he first read the report, Tony O’Brien stated that he was “appalled” that funds had been used in that way, and said that “it was a heart-sink report, no doubt”. When the HSE asked St John of God’s if they were in compliance with public pay policy, they responded stating that they were compliant, even though current developments suggest that this may not be the case. St John of God’s had not responded on the 5 May and 20 May to emails from the HSE which informed them on Fempi regulations and government pay policy, and asked for clarification of compliance around a number issues, including employee remuneration. They responded on 6 July, assuring that all remuneration is in accordance with pay scales, and if there were any over-payments made, they have been or are being recouped as quickly as possible. 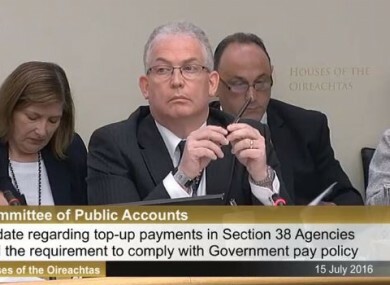 The chair of the Public Accounts Committee Seán Fleming stated that it was an ”extraordinary procedure” that the HSE had to investigate financial irregularities. “The biggest state organisation spent months carrying out this report. David Hall [interim boss of the Console charity] said that the charity appeared to be ‘hopelessly insolvent’,” said Fleming. What lessons has the HSE learned at this point? We haven’t heard anything about the lessons learned at this point in time. The HSE denies that there were any wrongdoings or errors on their part in monitoring the funding of Console. Yesterday, lawyers for the HSE told the High Court that Pieta House will take over the functions of Console and that the charity would be liquidated. David Cullinane (SF) said that the internal audit showed “extraordinary failures”, which the HSE should have acted upon much earlier, and has national implications for the HSE. “The internal audit showed clear failings in relation to documentation, high-level failures that should have been red flags for the HSE and were all missed,” said Cullinane. O’Brien said that he believed the HSE got value for money for Console because “the services that were paid for were provided” and that the National Office for Suicide Prevention was satisfied as to the quality of those services. Failings in the report on Console are failings within Console,” said O’Brien, adding that the HSE was “underpaying” for the services Console provided. However, Cullinane stated that of the €294,000 that was provided to Console by the HSE (40% of their total expenditure), documentation wasn’t provided to prove the funding of the charity’s call centres – yet the funding was granted anyway. “It cannot be proved what the money was used for, you cannot find documentation to support those costings. So if that’s the case you cannot say you got value for money. You can say that the service provided was a quality service, but you cannot say it was value for money,” said Cullinane. Meanwhile, the new Charities Regulator has published their Strategy Statement 2016-2018, which includes a list of responsibilities, and its vision for the next three years. The Regulator aims to become a “vibrant, trusted charity sector that is valued for the public benefit it provides”, and will begin this by establishing a public register and reporting framework for charities operating in Ireland. Email “HSE found out Console charity status was withdrawn through media reports”. Feedback on “HSE found out Console charity status was withdrawn through media reports”.